"3 weeks on the roads of Australia." A family-owned company, Cruisin’ Motorhomes have been in operation since 1999. 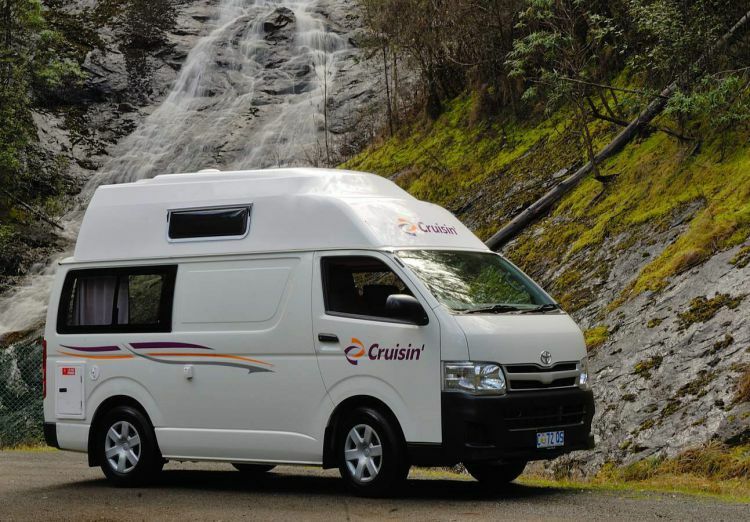 Based out of Tasmania and at first and called Cruisin’ Tasmania, they soon expanded to cover more of Australia, and now have branches up and down the east coast in Hobart, Melbourne, Sydney, Brisbane, and Cairns. 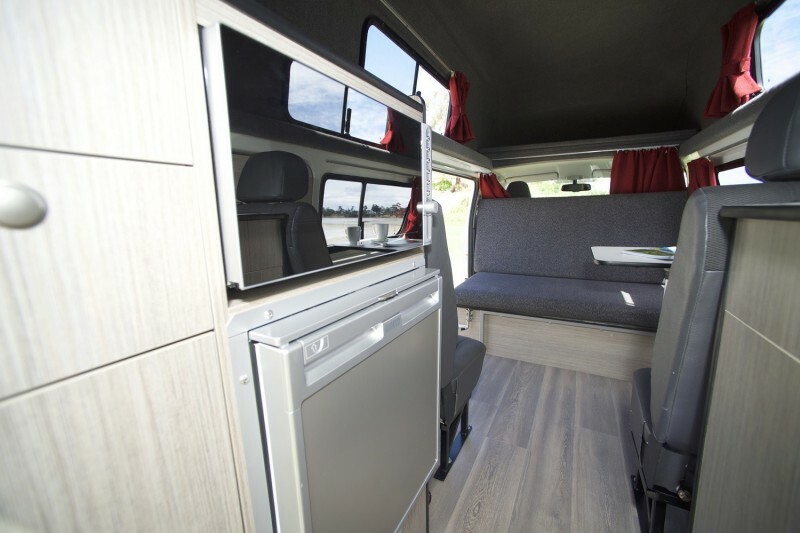 Offering a range of vehicles with 2-berth campervans being the most affordable option, as well as motorhomes ranging from 2 to 6 berth—their focus lies primarily on providing a modern, home-away-from-home travelling experience. All vehicles in the fleet are a maximum of four years old. 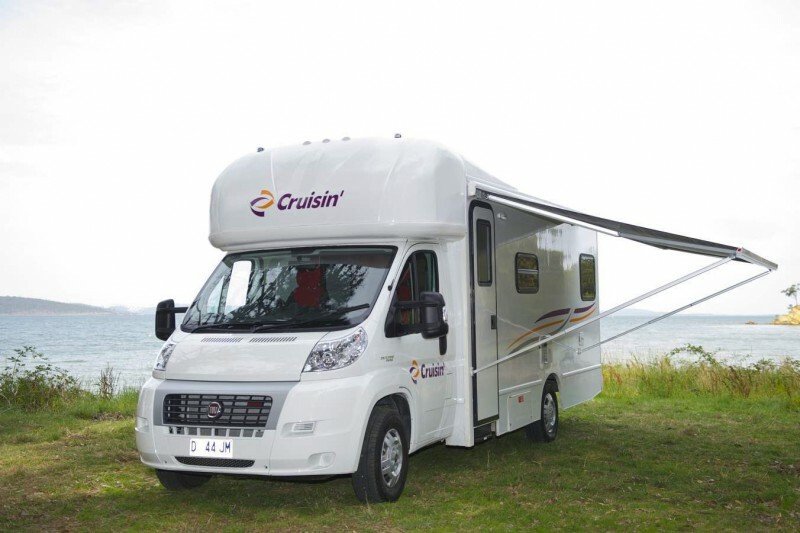 Cruisin’ are the third largest company of their type for 4- and 6-berth rentals in Australia and offer motorhomes in these sizes, as well as 2/3-berth motorhomes and campervans of the same capacity. 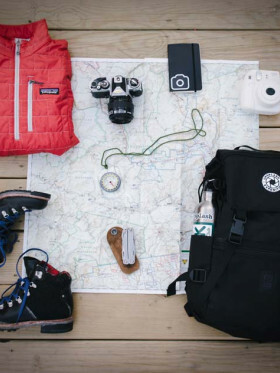 All vehicles come equipped with linen, cutlery, crockery, and bedding. None are equipped for car seats for children under four years of age, although they are suitable for seats accommodating children between four and six. These can be hired—along with camping chairs and tables—for the duration of the journey at$35 apiece. The 2/3-berth Toyota Hi-Top is one of only two campervan models in Cruisin’ Motorhomes’ fleet. Featuring a double bed with an additional overhead single, it’s a good size for parents with one child or a couple on a budget who’d prefer not to drive a full-blown motorhome. As is to be expected from a vehicle of its size, there are no toilet facilities, but it features a microwave,two-burner gas stove and fridge. 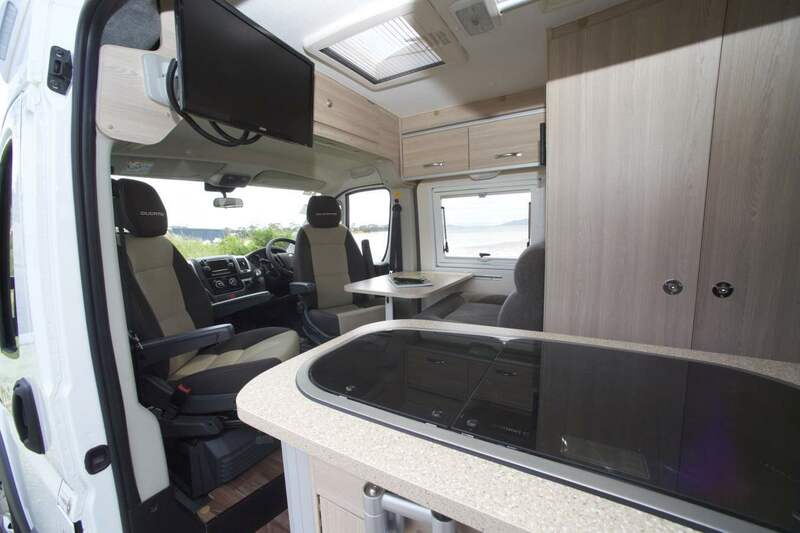 The 2 berth Adventurer motorhome may be the smallest self-contained motorhome in the fleet, but it can pass as a 3 berth campervan with an overhead double bed and dinette single. Best for two people, either with or without a child to bring along, it is compact and cost-effective. Along with the amenities that come with the campervan models, a 90-liter fridge-freezer means that those who are planning to bring food along and save on costs are well-suited to the Adventurer. 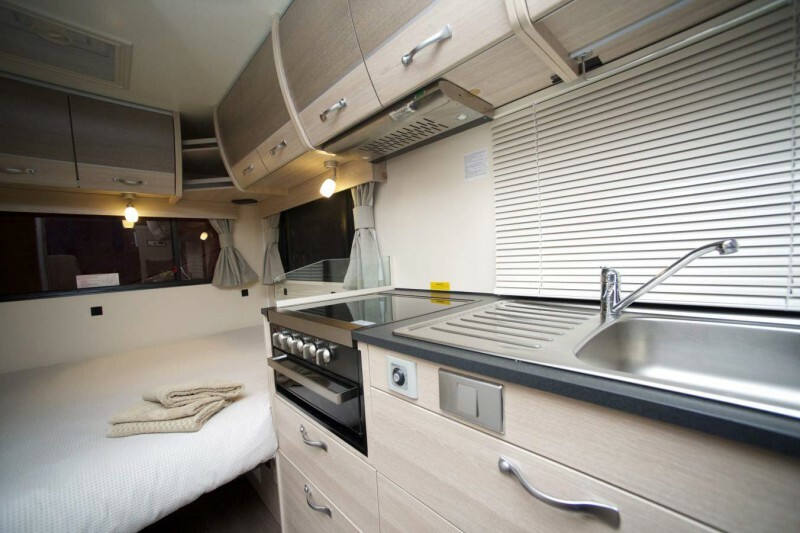 The 2-berth Sandpiper campervan model is much more luxurious with its additional space, along with a toilet, shower, and television in addition to the cooking facilities of the Hi-Top. An open walk-through passage between the driver’s area and the main cabin is a bonus. 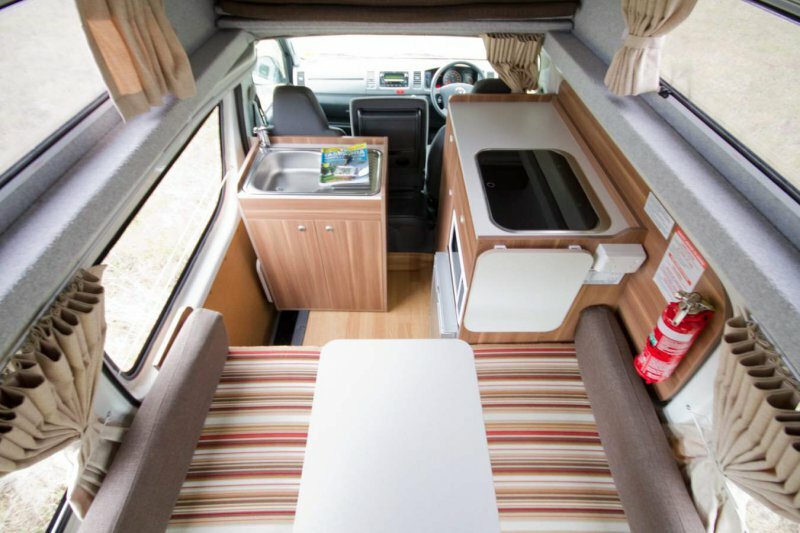 For two-person groups with a little more money to spare and a preference for having enough room to move around, and for those who would still prefer a campervan to a motorhome, the Sandpiper is the best option. 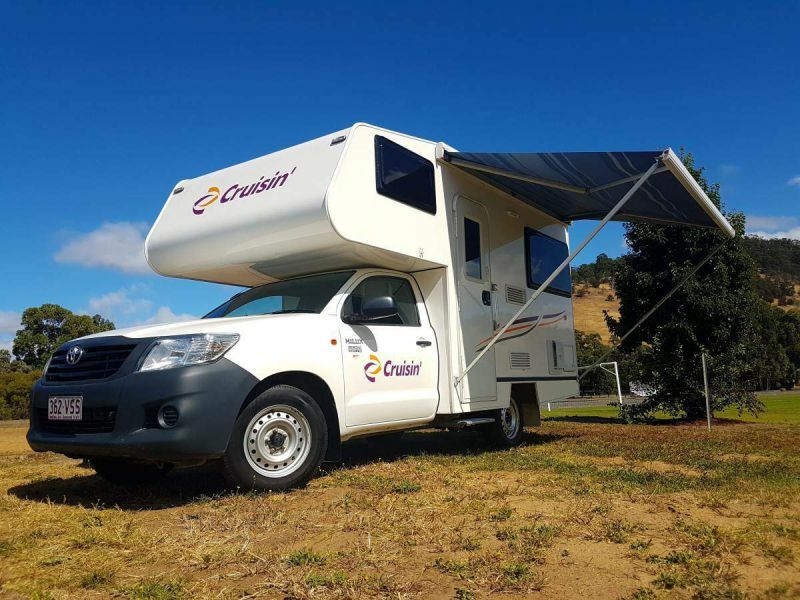 If you are a family of 4 looking for a budget-based campervan, then this automatic Toyota Hi-Top is a practical choice for your travel needs. 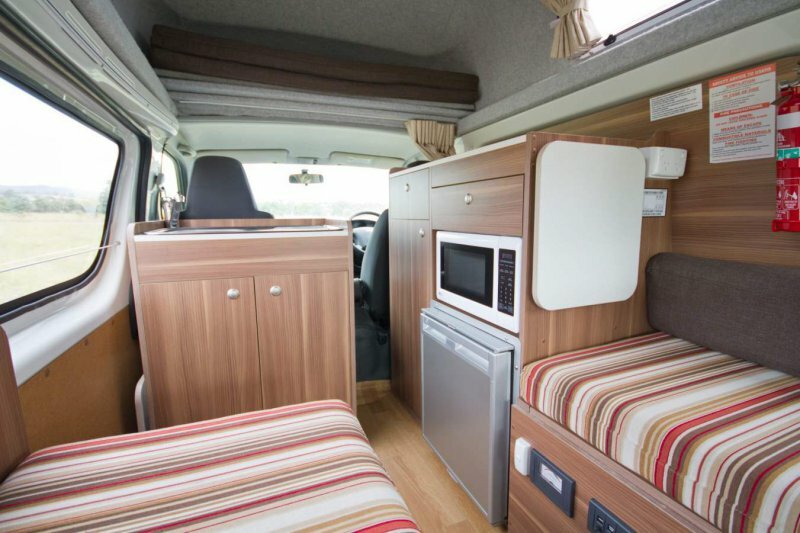 Great for two adults and two children, this campervan is also a comfy choice for couples wanting extra space and comfort. Equipped with an overhead bed and pull-out double bed, there's no need for a complicated bed set up. Plus, the entire rear area is for the fully-furnished kitchen armed with all your cooking needs. 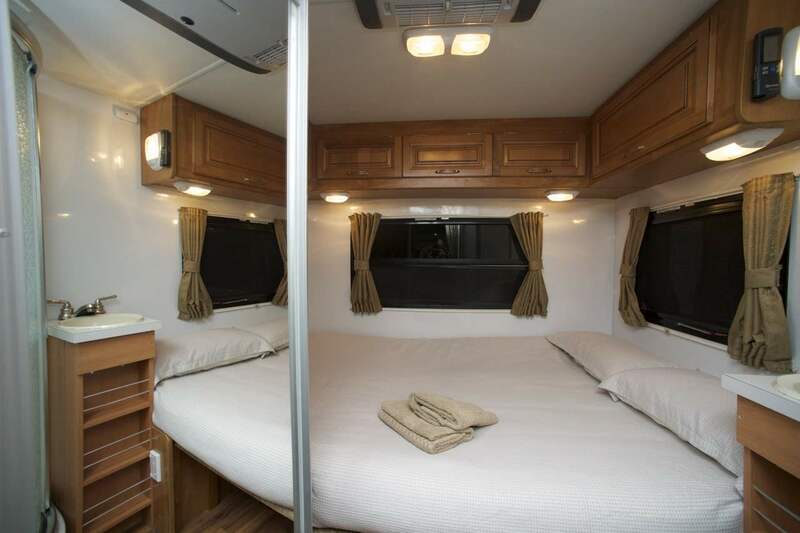 The 4-berth Seeker motorhome seats four adults, and has one permanent double bed in the rear and one above the driver. Bathroom facilities and a relatively spacious kitchen are provided, along with a radio, television and CD player; it is also equipped with an awning. This is one of the newest motorhomes on the fleet, hence a smoother ride. 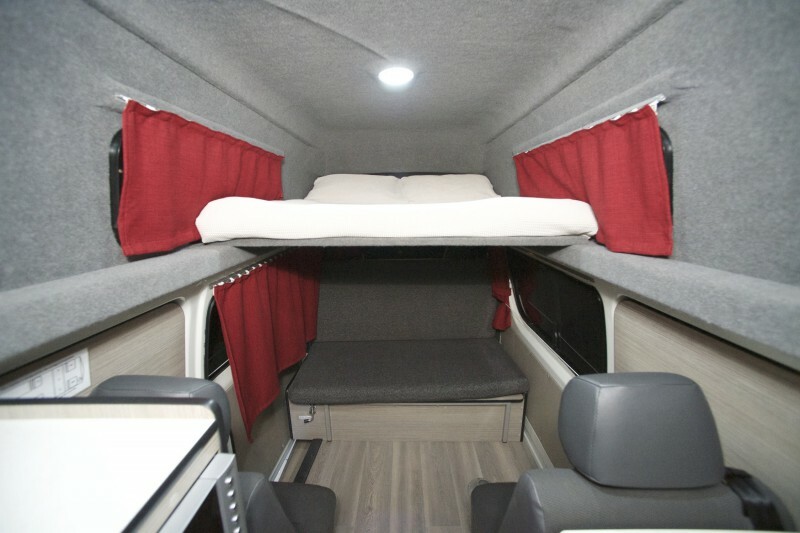 The permanent bed in the rear could be seen either as a bonus because you don't have to set it up each night or pain as it means all table activity happens around the one small table situated behind the driver. Personally, I would prefer the option to pack the rear bed away. Also, the shower is see-through enough―so if you are two couples travelling together, there will be some privacy/access issue. All in all, though this is a plush camper. 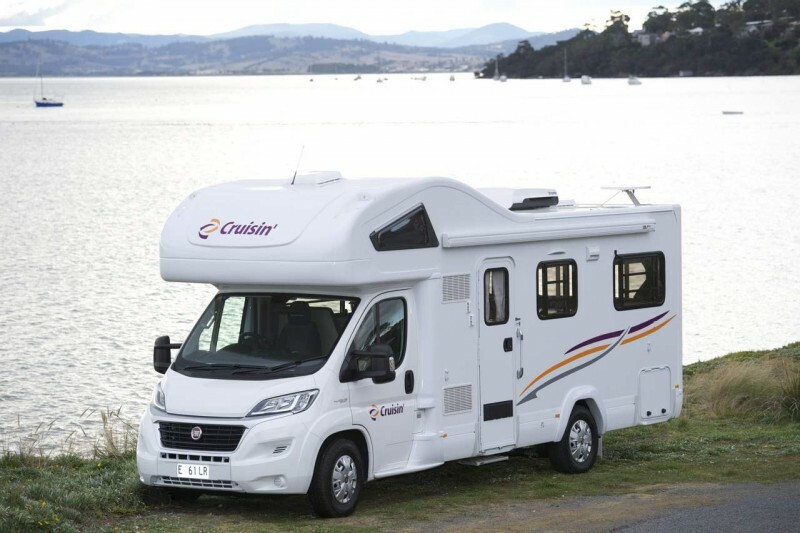 Cruisin’ Motorhomes offers two 6-berth motorhome models. Let's begin with Discovery. The Discovery comes with one permanent overhead and fold-out double beds from the dinette and rear lounge. 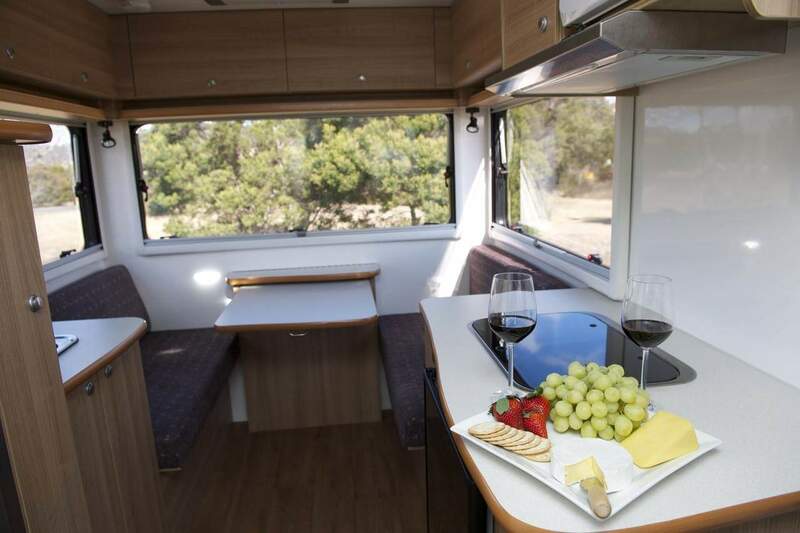 Along with all the other amenities provided in the 4-berth Seeker, it also has a whopping 110-liter fridge-freezer and a 3-burner gas stove. It will be the older of the two 6 berth models, so expect a little wear and tear. It is built on the VW base with a diesel engine and auto transmission. The Deluxe, as the newest addition to the fleet, is significantly larger, with two main living areas and a 190L 3-way fridge. Built on a Fiat base, it's the plushest motorhome that Cruisin' offer with a guarantee that it won't be over 2 years old. With all the latest design features this motorhome is sure to satisfy anyone looking for a full 5 star apartment-on-wheels when they travel. 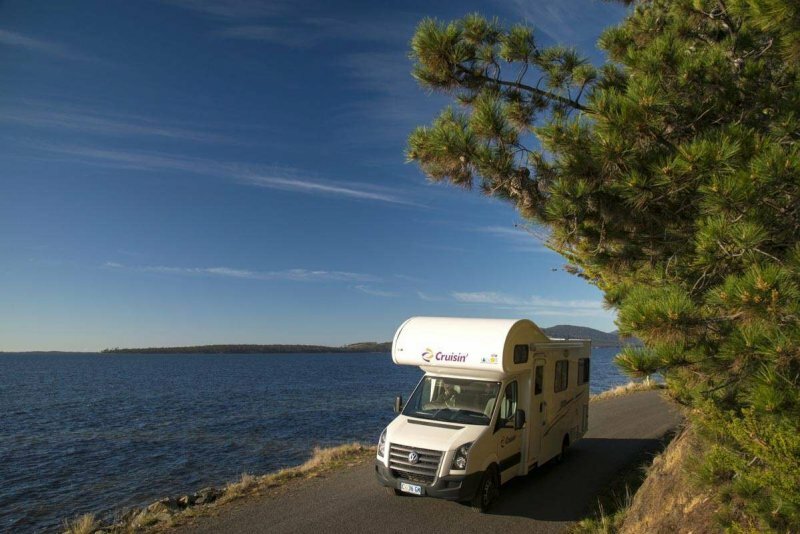 All Cruisin’ Motorhomes vehicles come with standard insurance, which is a $5,000 bond. This payment is collected by credit card at the point of creation of the rental contract. You have the option to reduce the liability and security bond to $0 thru the Liability Reduction Option at $45 per day. Further, there is the Maximum Cover Package at $55 per day that includes windscreen and tyre damage, pre-purchase LPG, GPS, camping table and chairs, toddler and child seats—on top of the Liability Reduction Option coverage. Customer opinions of Cruisin’ Motorhomes are divided. Many have praised the low rental rates and comparatively high quality of the vehicles in their fleet, which are reportedly easy to drive and are equipped with great amenities. There is also plenty of appreciation fort heir wide range of pick-up and drop-off locations. However, a sizeable minority has complained that despite the well equipped and modern nature of the vehicles, they often come out in bad condition and are poorly maintained. Flimsy awnings and faulty batteries have been reported, along with necessities like fly screens being barely functional, and oversights that can end up making vehicles road-illegal such as missing rear bumpers. What’s more, the company can apparently be dismissive of these important issues, claiming that the blame for pre-existing faults lies with the customer, and reportedly using any excuse to withhold bonds and get extra money out of those who complain, as well as providing poor customer service overall. Communications and refund requests have ended up being ignored or delegated to the point where it is impossible to get a straight answer out of the company, and some report that it’s as if they are trying to avoid responsibility at all costs. Many of the reviews with a generally positive tone still mention badly-maintained vehicles and stinginess with bonds—these problems seem to be near-universal among Cruisin’ Motorhomes customers, which is a serious cause for concern. 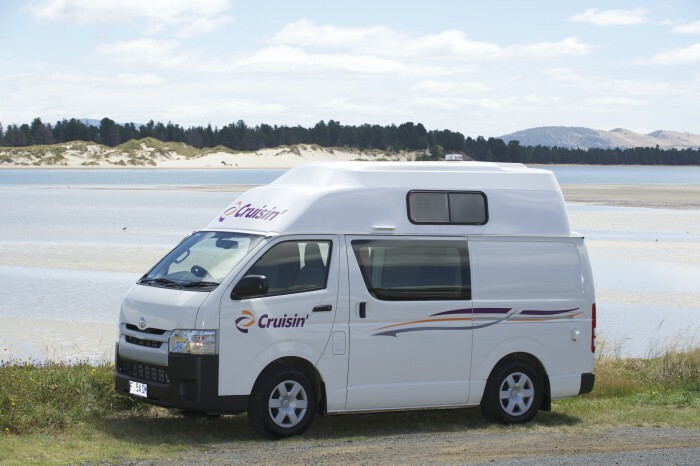 Whilst Cruisin' Motorhomes is one of the well-favored campervan rental options in Australia because of its business longevity and extensive fleet, this family-owned company continues to be work in progress, but in a good way (hopefully!). We rented a 4 berth seeker and were upgraded to a deluxe 6 berth when we picked it up in Melbourne. They were busy when we arrived (3 pick ups going on) but they kept everything moving and we were out on the road within 30 minutes. They were great with information and called ahead to a caravan park to get us a spot as unbeknownst to us we had arrived on a long weekend and most places were already booked. The Motorhome had 23000 km on it and was in fantastic shape. My husband had no problems driving it and we were very pleased with all the amenities. There were only 2 of us but since we were in it for 3 weeks we really enjoyed having some room to move around. We only free camped one night but had no issues being without power hookup. The unit was fully equipped with bedding towels and everything we needed to cook. 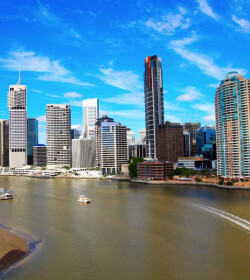 There was a heat wave happening when we got up around Brisbane and the air conditioning worked great. When we dropped it off in Brisbane they were very helpful again and called us a taxi. The Motorhome was a diesel and for the 5000kms we drove we spent just over 500 dollars. We bought extra insurance(not with company) I looked at every company and they were all very comparable with how they charged for deposits. I booked through Motorhome republic and was pleased with customer service and would have no problem booking with them again. In regards to the 5000 bond they require I just put an extra 5 grand on our MasterCard and didn’t have to pay any interest. It took them the 10 days to refund the bond which makes sense so they could make sure we hadn’t broken anything or missed paying tolls or something. It was a wonderful experience and I would recommend it to anybody. I have rented a lot cars for 20 years (I am 43), and I have never written a bad review before now! If it had not been for that we got actually got a campervan from this company, I would have called this a scam. 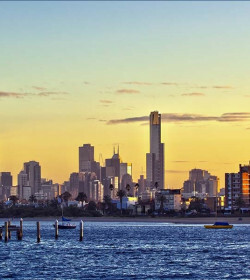 Our Booking confirmation for 9 days said a total price of 895 AUD, but after all the charges, surcharges and way to little money back on the bond, the REAL total price was 1359 AUD. When I pointed this out in several email with proof that they overcharged me by 464 AUD, they said its not their problem. So PLEASE stay away! 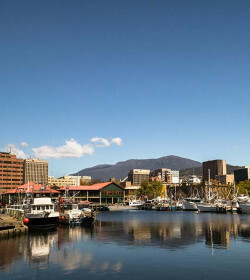 They are also located far from airport, so you will also have to pay taxi both ways (Tasmania), and there are several other car rentals very close to the airport I will chose next time. NEVER AGAIN! "Never rent again from Cruisin’"
Our experience was not great! It took over an hour after arrival at the depot to be handed the keys to our campervan (there were only 3 families at reception and 2 customer service reps). There is no pick up from hobart airport, so you need to grab a cab to take you there - which isn't too far $7 uber ride. When we refused the fully comprehensive insurance (which was an extra $65 per day ($650 for the duration of our hire!) we had no option but for Crusin to take a $5,000 bond AND have to pay a $100 admin fee!!! When we challenged the customer service rep we were appalled by the attitude - "I'm only doing my job" "you ticked the T&Cs" "write to customer services". We were then presented with a printed set of the T&Cs. Under section 'Financial Obligations' there is no mention of a $100 admin fee for taking a $5,000 bond off your credit card! You have to search for that further on under the 'Bond' section - so beware when making price comparisons with other companies!! On returning the van, we had to call and email repeatedly to get a refund our our $5,000 bond (which is not just a hold on your card, but an actual purchase). After 3 phone calls and 4 emails we received an email to say that "there was a problem with your card, please call the office" - further delays! Apparently their booking system only holds credit card information for 3 months after you make the initial booking. So if you do decide to book with them, make sure they have your credit card details stored to avoid any delays The van itself was fine, beds were uncomfortable, but you get used to it! Its a bit of a converted tradie van (4 berth hi-top) but did the job and like everywhere else EXTREMELY overpriced for that time of year (christmas school hols). "Worse company I have ever dealt with." After leaving the agency on day one, the first stop, the camper would not start. I called the company and was told I would get a call back. No one called. I fixed it myself. This continued for 4 days and had to continued to have the same problem and the company would not bring another unit. Friday night arrived in Sydney and had the same problem. Thinking because it was a large city I would get help. No. They told me there was nothing they could do until Monday. Do yourself a favor. If you are thinking about using this company DON'T. "Very dodgy company. Poor customer service. Unethical terms and conditions"
We are so disappointed with this company. We have been told we are liable for damage we did not incur during our rental - it is basically our word against Crusin' motorhomes. Unfortunately, they win as we signed the condition report, we did not notice the minor damage on one of the accessories until a couple of days into our trip. In good faith we took pictures immediately and emailed them through. This is not good enough for Cruisin', and they have deemed us liable. We have travel insurance thank god, but please please people take CLOSE UP pictures of every accessory if you can because if they see an opportunity to charge you - they will. Crusin' are holding onto a deposit of $5000 of our money until they get a cost for the minor repair, they are unable to state how long this process will take. It has now been 10 days. The $5000 deposit is ‘mandatory’ and you are charged a non-refundable $100 transaction fee unless you upgrade to Cruisin’s dodgy insurance package (which has way too many stipulations and loop holes). The advertised price on the Cruisin’ website does not include the $100 transaction fee for the deposit. This company breaks Australian Consumer Law, and we are in the process of reporting this company to the ACCC. Crusin’ have recently been fined by the ACCC for charging excessive credit card fees to customers. Wish we had done our research! On a positive note, the Sandpiper was a nice vehicle and we enjoyed our holiday. Just wish that Cruisin could be more ethical and lawful in their practices - not cool to hang on to people's money with NO customer service or communication whatsoever. WE have engaged every point of contact with Cruisin’ and are met with vague- varying answers regarding the return of OUR money. "Missing customer service and bond"
The customer service don't reply. We have not heard anything about our 5000AUD bond yet and we returned the car a week ago. They keep telling us that they will send our mesage to another department and then we never hear anything. "I regret Choosin’ Cruisin Campervan hire"
Hobart office. Shocking customer service. Electrical faults with van. Wrongfully charged me for damage caused by previous customer. Attempted to wrongfully charge me to replace damaged awning ($1250) they later admitted caused by previous customer. Day 1: Booked van broke down. Had to wait 3.5 hours for another van to be (rushed) prepared. Was sent off at 6:15pm without ANY instruction on how to hook up van (or anything). Staff member had to go do paperwork, told me to watch video when I got there. Drove into first ever caravan park in the dark. No idea how to open side hatches to access power cable. Wasted an hour while children hungry for dinner. Used camp kitchen. Day 2: wasted 30 mins calling Cruisin trying to isolate why electric hot plate didn’t work. Unresolved. Used camp kitchen. Night 2: wasted an hour trying to isolate why internal electrics not working . Included moving the van in the dark to another site. Cruisin adamant the issue was with caravan park, their vans ‘never have electrical issues.’ Day 3:(In total lost 5 hours due to problems) Left Park 2 hours late as had to charge all devices in camp kithen. Caravan park management (rightly) argued the electrical issues were not with them. Abandoned plans to free camp as van had not been charged. Arrived at new caravan park. Internal electrics still not working. Wasted 2 hours, called Cruisin, (message) waited 1.5 hours for return call. Cruisin wanted me to stay at caravan Park for one hour til local electrician could get there. Seriously. No! Was finally taking my kids for a walk in Bay of Fires - cut walk short and ended up driving to electrician’s workshop. One hour later most of electrics working thanks to strung up extension cable(!) Had to prepare dinner with electrician lying across floor. Hungry children again ate dinner late. Fed up with all issues . Returned the campervan one day early. On return was accused of causing paint scuff to awning, and charged damage administration fee. (they later admitted was previous customer). Do not trust them!!! take your own pictures of the entire campervan before driving it away!!! One week later got an invoice for $1250 for replacement of damaged awning! They had to admit damage was caused by previous customer and not charge. Our trip was planned for months, and long looked-forward to. Thanks to all the time wasted trying to work out problems with the van, we missed out on major highlights of the trip - didn’t get to Wineglass Bay, kids didn’t get to see fairy penguins in Bichenot and all soul-crushing phone calls to the Cruisin helpline instead if enjoying our holiday. Several people we met along the way had van breakdowns and other issues with Cruisin. 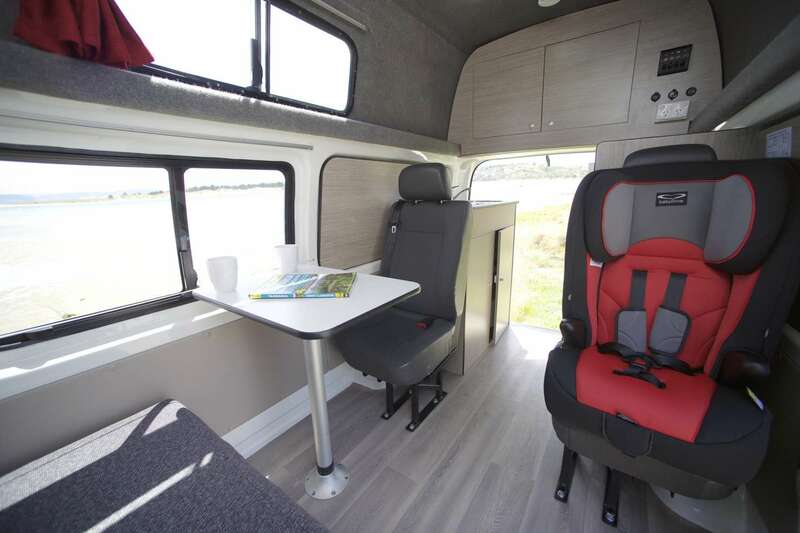 I heard very good things about Apollo campervan here. Would go with them next time. Booked a specific vehicle. Was advised by competitor (when checking prices) that this vehicle was not available in Cairns. Sought and got an assurance from the company I was dealing with that it was available. On arriving for pickup, sure enough, different vehicle. On questioning this, the Cruisin staff member confirmed "we never have that in Cairns". They took my booking knowing full well we were not going to get the requested vehicle. That is dishonest trading. They say it's an "upgrade" like they have done me a favour. Had they been honest I would have chosen s company that had a vehicle to suit our needs. Condition of vehicle was spotlessly clean. Broken rear fender. 2 pot drawers that fall out, had to take them out when travelling. Check in and check out were really fast for me but we did pick up early. The van we had was great, the best we have had in Australia and we have had a few. The price was good compared to others we have used. We hired a 6 berth campervan at the end of September. From the Brisbane depot. The office was really busy when we arrived with people checking in and out and the staff were a bit run off their feet but still smiling. We had to watch a comprehensive video before we drove off where we picked up some useful info. The camper was spotlessly clean, great to drive on the open road and it felt quite new so no significant rattles and no mechanical issues either. Because we hired it during shoulder season, the rates were very reasonable. BEWARE of third party insurance companies selling you cover if you’re not booking directly on the Cruisin website. You will have insurance options when you collect it (and not pay twice like we did). 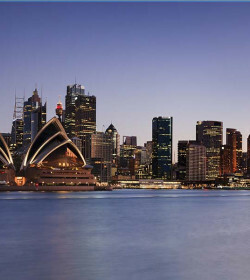 "Poor service and livability - Sandpiper Motorhome"
Hired from Sydney. Service was very poor. Took over two hours to arrange the hire. Only one staff member with multiple customers. Some local staff had a poor command of English which made communications difficult. Sandpiper is very cramped and bed height was an issue for us. Toilet /shower compartment is small. Television did not work - even after assistance from company could not tune in stations. "perfect from a to z"
picked up my campervan in cairns within minutes, got an upgrade to an absolut perfect camper. wish i could have kept it. had the best 3 weeks in australia with this absolutely amazing camper. staff is also friendly and uncomplicated. (the only thing, that i could suggest to improve, is that there is a management fee of 100$ that was not really clear stated when i booked the camper. this fee should be included in the rental price so the comparison of the vans actually make sense...). thanks a lot to cruisin for everything! "Perfect trip and excellent service!" We had a perfect Trip with the van of No Worries! We can definitely recommend it! "Great campervan for our roadtrip! Definitely recommend!" The campervan we got was the 2/3 Berth which was an older model but actually had a great setup and enough space for 2 people to move around! Everywhere we were stopping by, people looked at our camper and were impressed by the look of it. We have driven for 3 weeks from Sydney to Cape Tribulation and we had no issues, it was actually perfect size, not too big so that wouldn't drive fast enough and not as small that can't move in it! 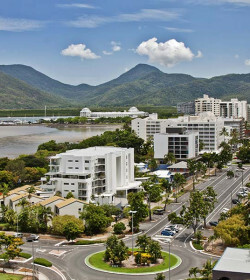 On our way, we also stopped by the Cruisin in Cairns and the staff was amazing and friendly, helped with any questions, tiny issues and provided with tips for the rest of our way. On our final day, the guys gave the order to release the bond liability which was actually back in my account within a week although informed that may take up to 2 weeks. In addition, Cruisin also returned back the interest amount that my bank charged due to the transaction made! Overall we were very happy with the campervan, the total experience and the young & friendly staff! Compared to previous experience as well as the price on others companies, our campervan was similar/better and cheaper. A family holiday,traveling from Brisbane to Townsville with a Cruisin berth 6 a great motorhome,lots of space for the kids,very easy to drive in good condition all in all a very positive experience,would recomend to enyone.Also the price was great,we took the motorhome for a month and no problems at all.The service at Cruisin was very profesonal and frendly-great job. "Vehicles okay but bad cs"
Okay vehicles. Not very clean but nice but my experience with customer service was a nightmare. "BEWARE: HARD TO GET YOUR $5000 DEPOSIT BACK"
When you rent from Cruisin they debit your credit card $5000. The debit appeared on our credit card the following day. We returned the van and it was agreed there was no damage. Fifteen days later we are still waiting for our $5000 back. They tell me it is over Xmas and things take longer. They tell me their accounts department takes that long to process the return of our money. They tell me it was transferred back to us 8 days ago. Why don't I believe any of that? This is simply not good enough. There is absolutely no reason for them to continue to hold our money. So if you want to rent from Cruisin be aware of this. Allow a lot of waiting time on collection of your vehicle. Inspect every aspect of your vehicle thoroughly. We have hired the deluxe motorhome from this company at the beginning of December but there was nothing deluxe about our experience. The motorhome was not clean properly with cockroaches everywhere at night which made it very uncomfortable for the whole family. In fact we ended up staying in a hotel the last night of our holiday. Anyway save your money and either choose another company or go to a hotel. We will never repeat this experience again.